Flynn Fairwind: You see those salty looking guys in red? That’s the Irontide crew. They’re the worst of the worst. Cutthroats and brigands, to a man. Irontide wouldn’t be guarding the docks if they didn’t stand to gain something… Lighten their pockets. See what kinda hardware they’ve got. Collect 3 Azerite Cutlasses and 2 Horns of Azerite Powder from Irontide Cutthroats and Irontide Trickshots. TIP: Only the Irontide Cutthroats and Irontide Trickshots drop the Azerite Cutlass and Horns of Azerite items. 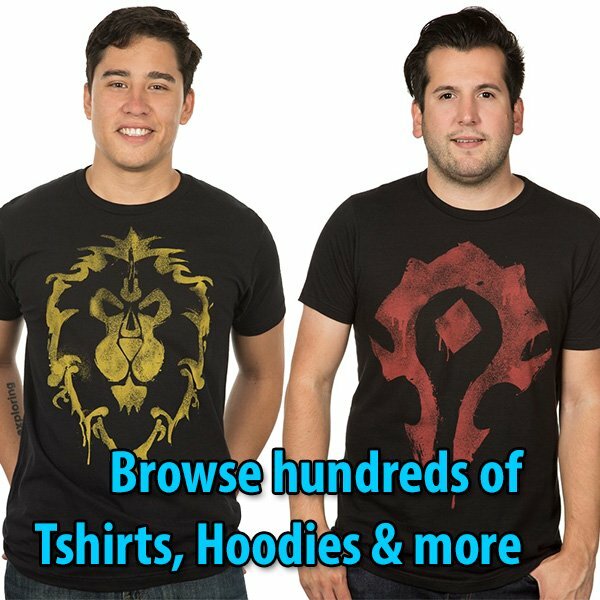 However, you will inevitably aggro Irontide Overseer, Irontide Ruffian, and Irontide Brinecaster, as they stand too close to each other. You might have to wait for respawn. 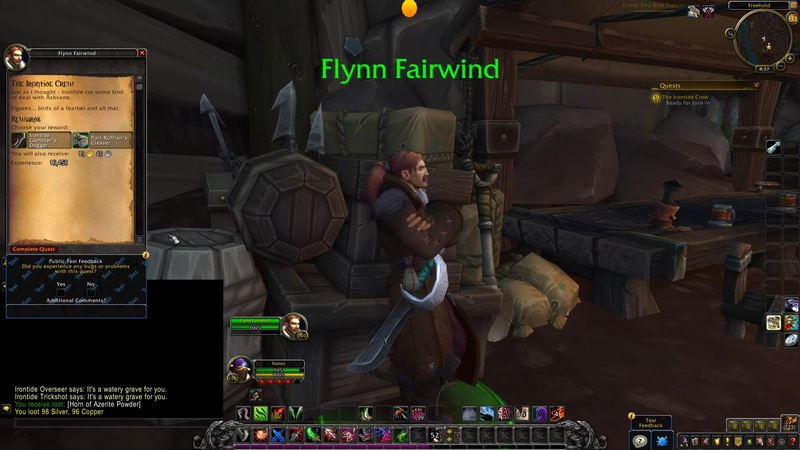 Flynn Fairwind: Once you have proof that the Ashvane Company’s been selling weapons to these scumbags, come find me up the hill at the main gate. I’ve been gone a long time. Let’s hope I still have a few friends inside. Irontide Ruffian: Stand and deliver! 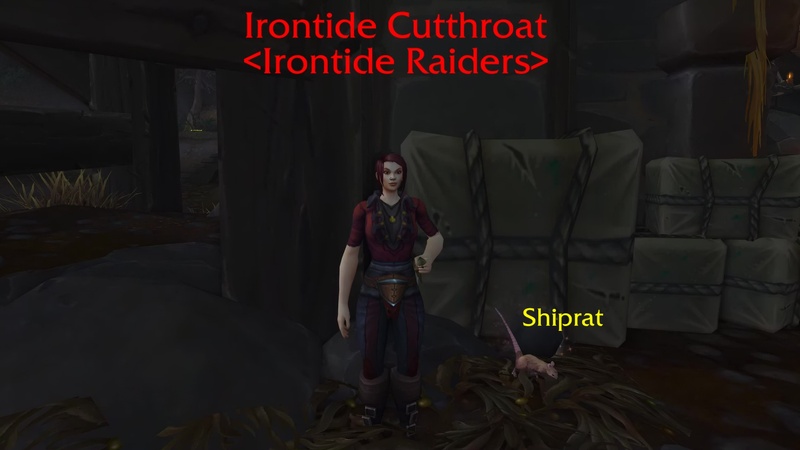 Irontide Cutthroat: I’ll cut ya from stem to stern! Irontide Overseer: It’s a watery grave for you. Flynn Fairwind: Good news: I think they’re gonna let us in. Bad news: We technically have to become pirates to get in. 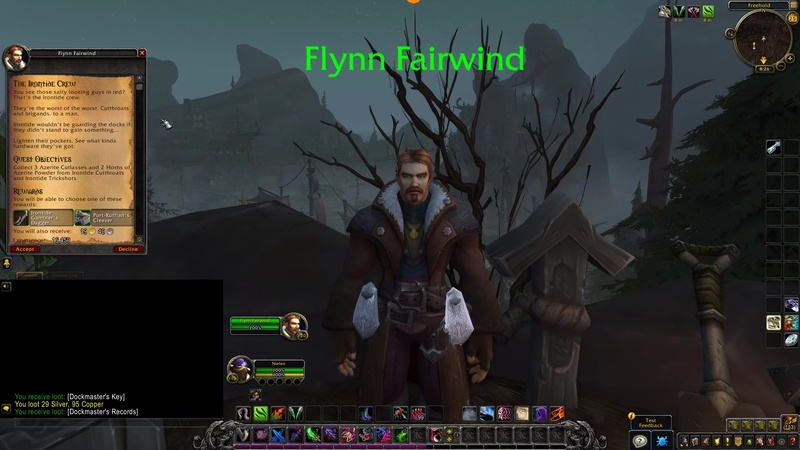 Flynn Fairwind: What have you found? Flynn Fairwind: Just as I thought – Irontide cut some kind of deal with Ashvane. Figures… birds of a feather and all that.